Tom Addison has now won the senior race now four times, Ian Holmes finishing second won the V40 trophy for the first time ever, while in third Gary Devine led P&B to the team prize. West Pennine athlete Neil Holding won the V50 picture trophy, and in the ladies race Jo Buckley is now a hat trick winner and 63 year old Sue Heywood was the only record breaker. 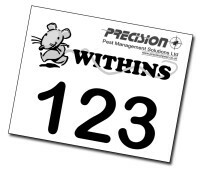 170 Rat Finks competed in the Curly Wurly rat Runs sponsored by Precision Pest Management. What a scary turn out in the fancy dress competition! 52 under 8's started the days proceedings with Eric Beaumont winning in 2-53 equaling the course record, Keighley and Craven also produced the U8 winner in Lucy Fryes. The combined U10, U12 & U14 races attracted 109 competitors and the star here was Sarah Pickering who demolished the GU12 record. The other girl winners were GU14, Olivia Sykes and GU10 Ruby Schofield. The winner of the race outright was U14 Emile Cariss with U12 winner Charlie Lowrie third. The U10 winner was Callum Durrans. It was records all the way in the U16 race James Hall and Annabel Mason rewriting the record books. Remember, it's great to win, so these races are competitive, but for those of you who just want some exercise and fun, then we guarantee this is the place to be. Sunday 23rd October 2011. The 20th Withins Skyline BM - 7m/1000' from Penistone Hill Country Park, near Howarth, W Yorks (GR 025364). Race starts 11.30am, entry �3 on the day only. PM/NS Over 18. Records 41.28 Alistair Brownlee 2006, f 48.39 Jo Waites 2006. Cadbury's Curly Wurly to all finishers. Free coffee and biscuits. Auld Lang Syne entry forms will be available to runners at this race. Curly Wurly Rat Runs. CS. Date & venue as above, starts from 10.30. �1 entry on the day only. 8 (over 6) 0.5m/100'; U10/12/14 1m/150'; U16 2m/300'. See the Quarry Runs page for records and a course map. Prizes for best fancy dress. 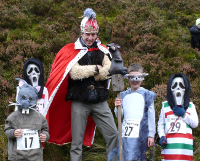 King Rat, Mike Ayers from the sponsor Precision Pest Management will be there to scare everybody and will be judging the fancy dress competition. Let's have a monster time here and see if you can frighten off the opposition to collect the chocolate on offer,there are lots of prizes in this category. Of course there still the serious side to the running where prizes will go to the first three boys and girls in U8, U10, U12, U14 and U16 races, each one of these will also collect a chocolate or toffee apple plus all category winners will win a bonus box of Choc 'n Blood Orange cupcakes. But the real reward for everyone is getting a goody bag, containing popping candy, a chocolate white mouse, a bag of Walkers crisps, a flump, a painter lolly, a race certificate, and of course a Cadbury's Curly Wurly, plus a carton of juice to wash it all down with. 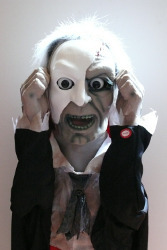 All junior runners are entered into a FREE PRIZE DRAW where you could win a terrifying Phantom Face Ripper, a tin of Cadbury's Heroes, or a monster hat. Finally the races finish with the unforgettable chocolate throw out, an event not to be missed by any youngster or grown up. STOP PRESS ... all junior prizewinners will have the choice of a signed postcard of Jonathan or Alistair Brownlee, who have also donated a bottle of Gatorade for each prizewinner.